As I posted in almost real-time, there were many summits on Monday morning on both sides and there were some surprises! Like an hour ago, said Alexander Abramov, today, 22 May at 4:30 am Nepal time the whole team reached the summit of Everest. Successful descent guys! At 6 am Moscow time all were already in 8300 and continued the descent. Peaks reached Valery Tebiev Daniel Briman, Eugene Kravt, Aznaur Akka, Alexander Abramov (in the 8-th time) . One of my favorite writers this year was Ricky Munday with Summit Climb. He turned back on his summit bid and explains in an excellent post on Facebook. Click to see his pictures and read the rest of his post. My appetite was severely affected by the altitude. After a big 10-hour, 900m climbing climbing from the North Col to Camp 2 (7,900m), all I was able to eat was a handful of peanuts, a protein bar and two mini Babybel cheeses. I could smell George’s freeze-dried meal and I almost vomited. For two nights, I had very limited intake. This lack of calorie intake was completely unsustainable, but I couldn’t force anything more down. I made the difficult decision not to continue with the team, and to descend. I was unwilling to put my life at risk or to become a burden to the team. I already provided updates on many commercial teams but a few more are just coming in. Asian Trekking’s Eco-Everest members Mr. Michail Evmorfidis and Mr. Antonios Sykaris along with our HAS Mr. Pemba Tshering Sherpa, Mr. Ki Dorjee Sherpa and Mr. Tshering Chhosang Sherpa left South Col (Camp 4)last night at 10 pm and successfully sumitted MT.EVEREST today on 22nd May 2017 at 10:30am.They spent 5 minutes at top and now descending. We are so happy for their great achievement and pray for their safe return. 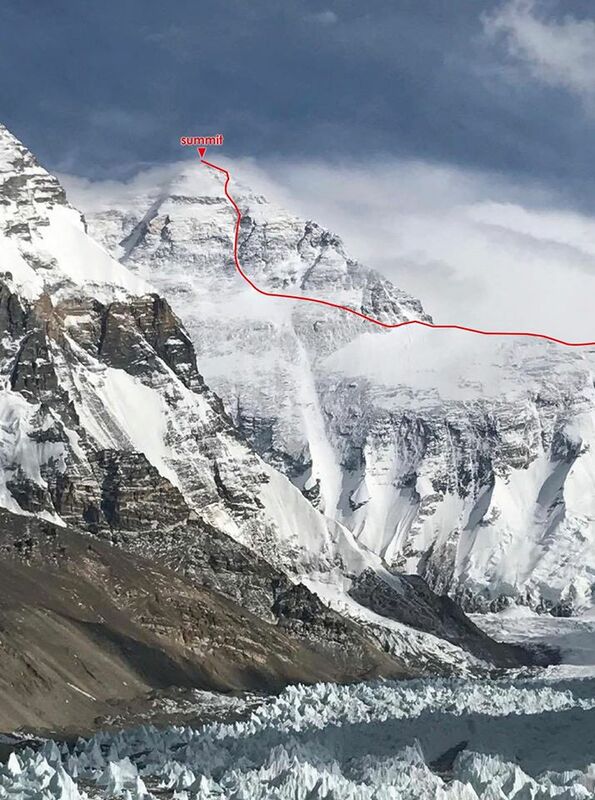 38 hours after starting the temptative, he has arrived to the Advanced Base Camp of Everest, he explained: “Until I reached 7.700m I felt good and was going according to my planning, but there I started to feel stomachache, I guess due to an estomach virus. From there I have moved slowly and stopping every few steps to recover. However, I made it to the summit at midnight”.Due to this indisposition, Kilian Jornet choses to conclude the attempt, and stay in the Advanced Base Camp and not returning to the Rongbuk as planned. UPDATE: There are many questions now being raised from use of oxygen, Sherpa support and illegally traversing without a permit. 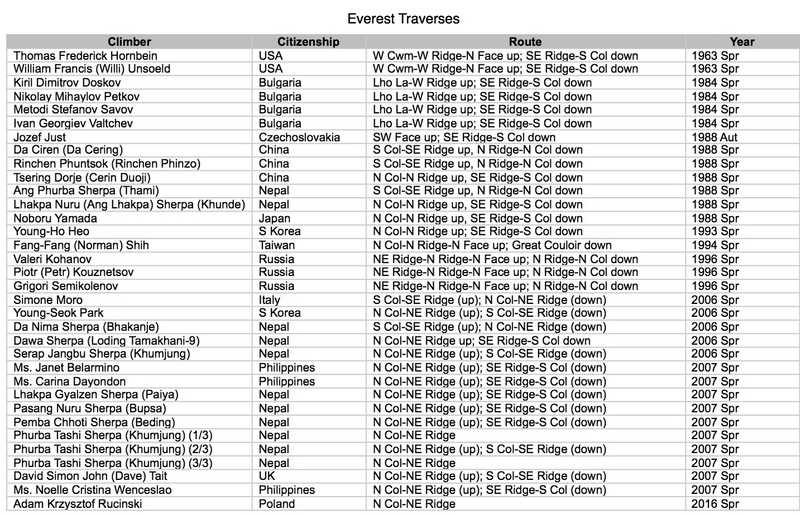 According to the Himalayan Database there has only been 34 traverse and only one without supplemental oxygen, Jozef Just, who died in the process. But we’ve been doing over the radio consult to the people having health problems at camp 2 and above. Over the radio night consultation was done, last night on a climber who was left between camp 3 and 4, and spent the night outside the tent in that area. Capt. Folini of Fishtail air with the help of our own Lakpa Norbu tried to bring him down via longline four times yesterday but failed to do so due to bad weather on the Lhotse face and western cwm. 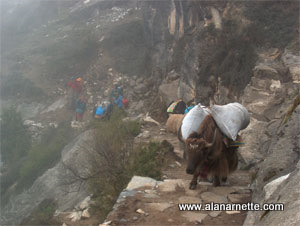 He was helped by two descending IMG Sherpas and four Sherpas who went up from camp 2 to get him down to camp 2. He was heli evacuated today during the first hour in the morning. Everest 2017 is far from being over. There are several teams positioned at the high camps waiting out what could be a short period of bad weather. Many are now looking at the 24. Hi this is David O’Brien. We moved up to camp 2 yesterday. There’s an adverse forecast for the 23rd so have stayed here before moving onto camp 3 . We are now aiming for the summit on the 24th. Amazingly I can get a phone signal here at 7900m. Yesterday me and some members of Kari Kobler’s North side Everest expedition came back to Advanced basecamp (6,300 m). I felt light, strong and well rested after a week in basecamp (5,200 m). The weather window I’m hoping for for an ascent without supplemental oxygen is slowly approaching and the time of being patient seems to come to an end. I’m in contact with Charly Gabl, meteorologist, mountainguide colleague and “my” amazing weather adviser for the last 20 years. Today maybe 60 Climbers only from the Tibetan side of Everest try to ascent to the summit. At my age climbing without supplemental oxygen one needs to climb at a very steady pace – can’t speed up for overtaking (loosing too much body warmth) or can’t wait at typical cueing points (loosing body warmth by just waiting). So I decided to wait for the atmosphere still warming more up and for not having to deal with lots of other climbers. Staying warm at this very high altitude is the key challenge of an ascent without supplemental oxygen. Only by hard and quick breathing the body is losing more body warmth than it is able to reproduce. I’m here to undertake my 8th and definitely last attempt to climb Everest without supplemental oxygen. Everest is the only of the 14 8000m peaks on which I used oxigene during the summit climb (early October 1992). Since then I tried six more times to reach the summit without supplemental oxygen. This time my acclimatizing program for an ascent of Mt. Everest without supplemental oxygen included an ascent of Cholatse (6,440 m; together with @nancyjhansen), a total of 16 nights higher than 6300 m, three nights at 7000 m and one night at 7,700 m. Slowly it’s time to get back to normal life.. .
IMG still has two subteams to go. Alpine Ascents is at Camp 2 ready as well. Good evening, ladies and gentlemen. Namaste. I’m still in camp 2 at 6400 M.
5:00 weather forecast this morning, 25 days more than the wind weakened forecast, and the west is a very dangerous place, so the wind is very dangerous. In order to avoid acting in West-the, he went up to West-ji temple from the morning to the West-the, aiming to attack on top of the mountain on the 25th. I have a little sore throat, but I’m not sick. I think there is a chance that the wind is weak compared to the fall. I’ll do my best. That all for now. Best of luck to all. I only recently discovered your blog and your work here is vefy inspiring Alan! It is a good way from Base Camp to ABC North. Summiting at midnight, after 26 hours (starting at 5.100m), solo & no O is risky as hell. Jornet is pushing the limit. Hope he “gets it out of his system” ? Thanks for the coverage Alan. Details appear to be sketchy, but how in the world does a climber (Ravi Kumar) get separated and lost from the guide that was assigned to climb with him? I wonder if this is just negligence on the part of the guide that was climbing with him. And how does one fall 200meters to a place where they can not be recovered whilst clipped into a fixed line? The story I read is that the guide also became very sick and had to leave the member because he needed to get more help. The guide managed to get to camp and send help for the member. They apparently had summitted late and were not with the group. I didn’t think it sounded like negligence but a matter of the guide leaving was the best chance they could both survive. I’m sure we will get more reports.